Inder Loves Folk Art: Housework. Hello peoples! Things are bustling in these parts. I've been really busy at work, and working really hard on our house, and yes, just a bit of sewing too. All of this frenetic and somewhat scatter-brained activity has not left me with a lot of time or energy for writing blog posts, but never fear, I'm sure I'll get my blogging mojo back at some point. Do you ever feel really inspired, but also really scattered? That's me right now. So rather than following some orderly path, this post will likely be as scattered as my mind is these days. So many disconnected projects! First up, progress in the kids' room! 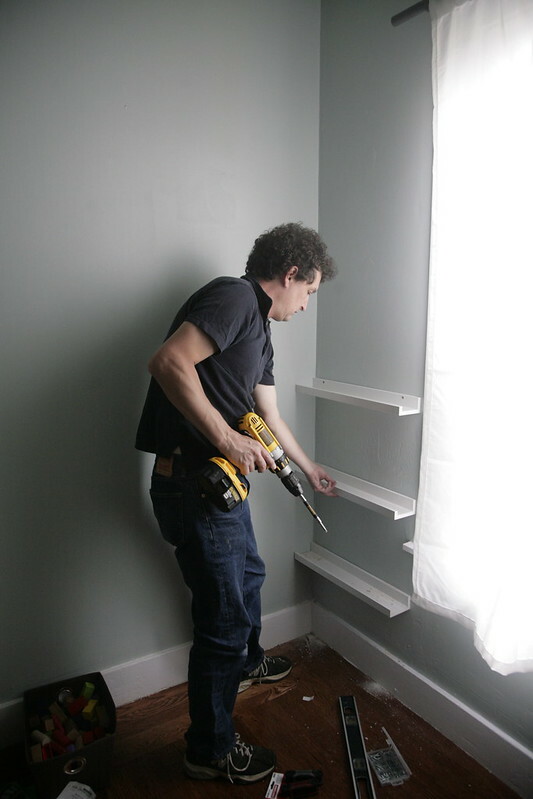 Steve put up little Ikea shelves for books. And we installed the giant wall map! 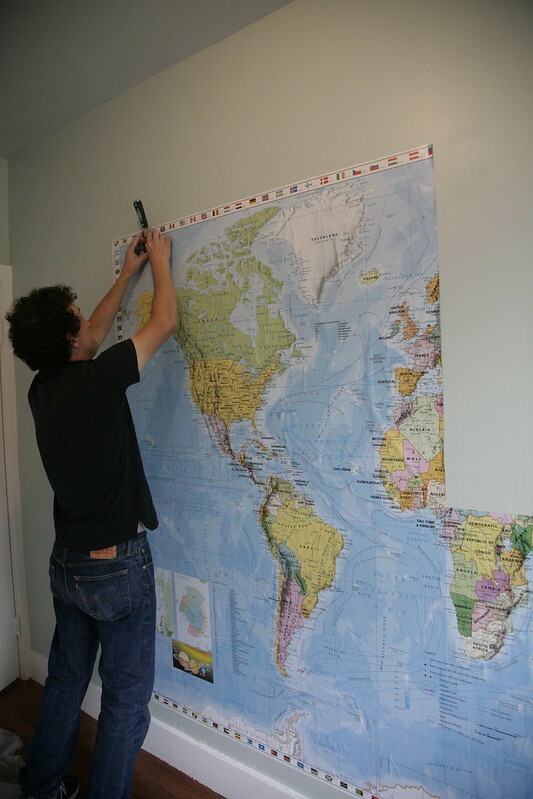 I got the wall map (which came with old fashioned wallpaper paste) on Amazon, and I love the colors, which have exactly the vintage quality I was looking for. I was a little disappointed that, at least when it comes to California, it's not actually that accurate, though! Sacramento is where Reno is, and Stockton is shown as north of us instead of southeast? Very strange and annoying. And now it's permanently affixed to my wall! ARGH! Oh well, it's pretty, even if it's not precisely accurate ... ? But look! It's so pretty! All this little reading nook needs is some floor pillows and it's ready to go. We haven't moved the bed into the room yet, but Joe, aka, "Hates All Change: Good, Bad, and Indifferent," actually seems on board with the idea! But rather than moving it in there the second he suggested it, we are leaving him wanting it for a while, hoping to avoid second thoughts and regrets. We know Joe pretty well, cough cough. He is also upset and disturbed by the idea that we will have to disassemble the bed to fit it into the room - he says, "No!! Don't take it apart!" in alarm. Because ... I'm not sure, actually. But we're working on it, and I expect this will be a real bedroom soon. Inspired by this transformation, I decided to take on an even more ambitious project: repainting my living room! 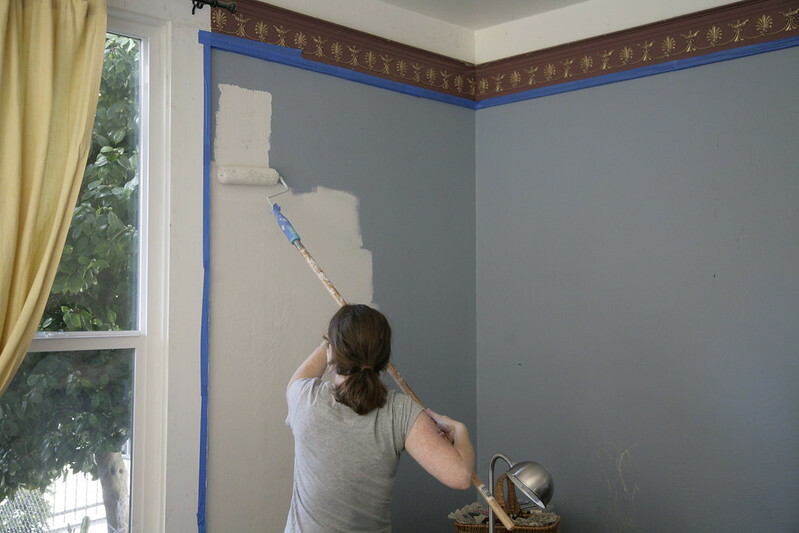 My friend Karen, who advised me to paint the kids' room Sherwin Williams "Rainwashed," told me that "Agreeable Gray" was the color for this room. Who am I to argue? We like it so much we are considering carrying it into the the dining room eventually. Do you see the kid scribbles on the wall to my right? They are GONE!!! Oh happy day! Steve has been such a good sport and has helped me execute all of my ambitious plans for the house! Eight years of living in a house with an underwater mortgage doesn't exactly inspire one to make improvements (because why bother? we'll never get that money back! etc. ), and of course, small children don't help much either. But I am ready to really freshen this place up. 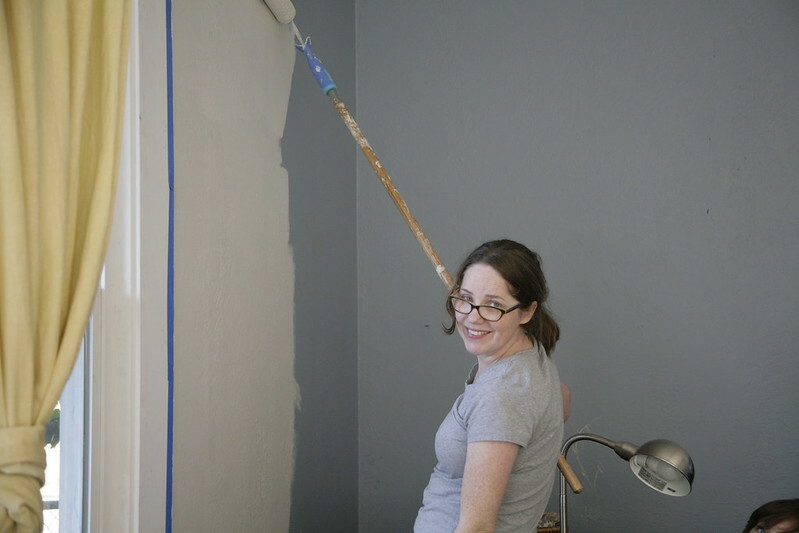 Yep, only a madwoman could be so happy while painting! And here's the room after yesterday's work! There's still some masking tape to pull off, and I plan to paint the baseboards and window trim today. 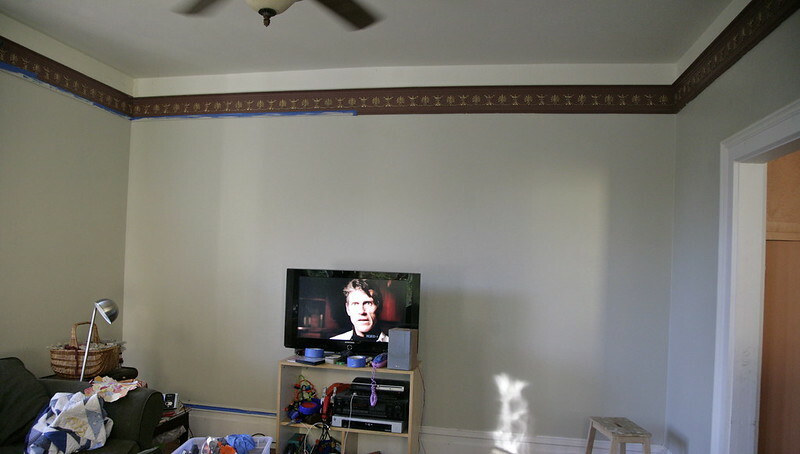 I bought encouraged my husband's buy-in on this project with the promise of a nice entertainment center on this wall, so we need to do some shopping! It's going to be awesome! 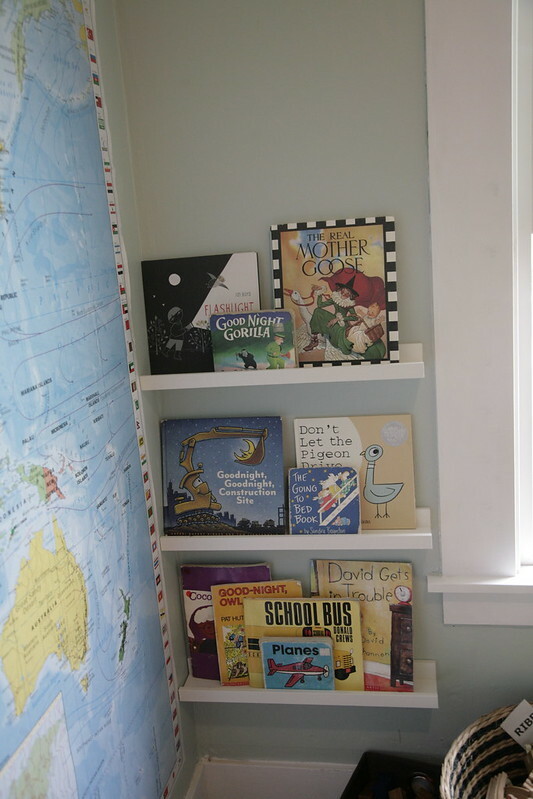 I envision lots of room for the kids' toys and our books as well as a place to put the TV. Since I have unilaterally decided that the room will have pops of cheerful yellow, pink, and red, I had to whip up a few new couch cushions to tide us over until we can afford new furniture. These have been very popular with the kids, at any rate. Everyone loves a nice cushion to snuggle with. 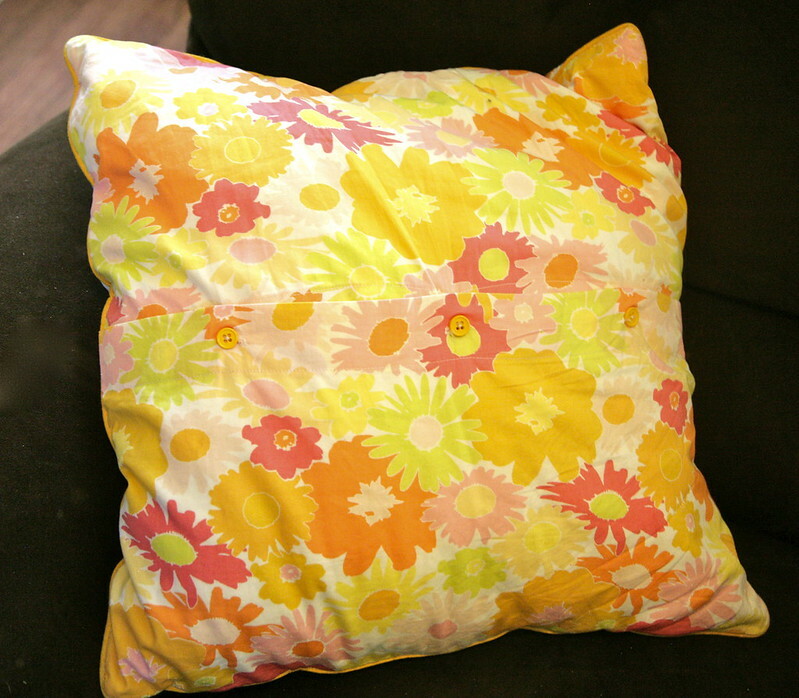 You know, in 20 years of sewing, I don't think I had ever sewn a cushion until I made these. Is that strange? 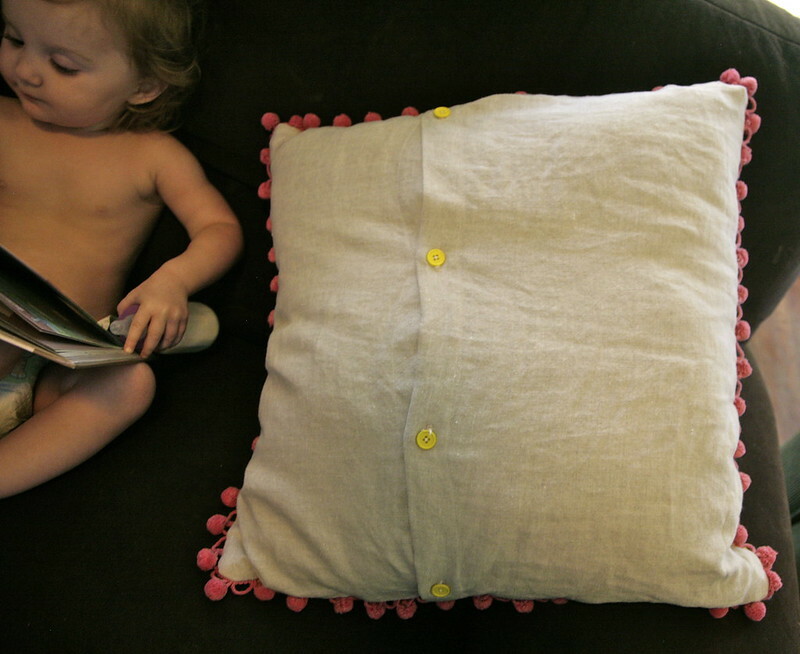 They are simple envelope style cushions with buttons on the back. I pieced and quilted the fronts and then used piping on one and pom poms on the other. Maggie is obsessed with pink and with pom poms right now. "MY PINK POM POMS!" She has been carrying my pom pom stash all over the house and refusing to share with Joe. I used natural linen on the back of the log-cabin-pom-pom pillow, and Art Gallery Fabrics Lazy Daisy to back the HST pillow. These are really fun and fast, and I'm busting through my stash of quilting fabrics. I decided that I had to have at least one hexie pillow! I am still deep in the trenches of hexagon addiction over here (my pile of Grandmother's Garden flowers is growing!). It's hard to explain the pleasure of watching a hexie project grow while you're watching Magnum P.I. and home improvement shows. I have plans for non-home-dec sewing as well, but if you've been following this blog for any length of time you've probably noticed I'm susceptible to intense "phases" in my sewing and everything else. I am powerless to resist the pull of my obsession of the moment! For me, "selfish sewing" is sewing whatever I feel like sewing! Which is most of my sewing, so I really can't complain. So happy Selfish Sewing Week! Sometimes we just need to feather our nests, right? :) I love how the kids' room is coming together! I love it all of it! The book shelves are a great idea. We are trying to take our home back from our kids as it looks like a day care center (and we only have two). It is a lot of work but will be worth it. I am scared of painting though. I've been sneaking pics of your renos on Flickr - so good to read the story to go along with them. You have such a lovely house - beautiful windows and light. Looking forward to the next update! I love it, Inder. 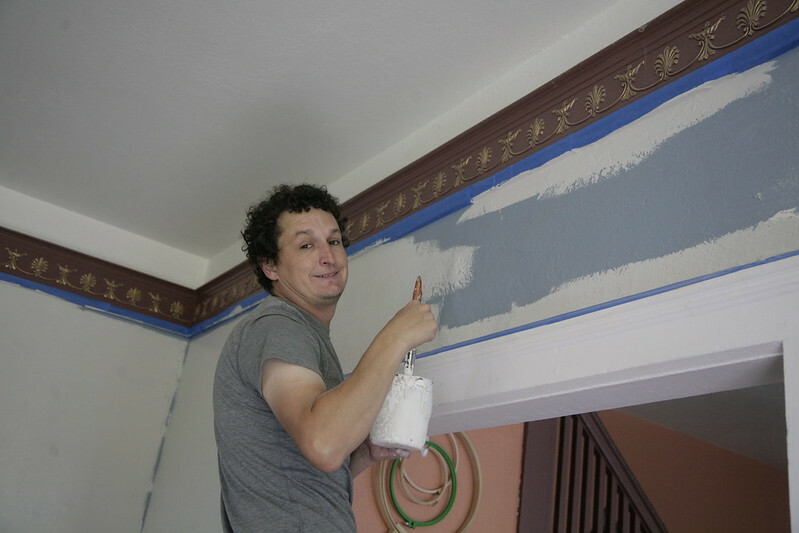 I might actually use your paint color for our living room, too. I LOVE it! It's amazing. Great, great job! 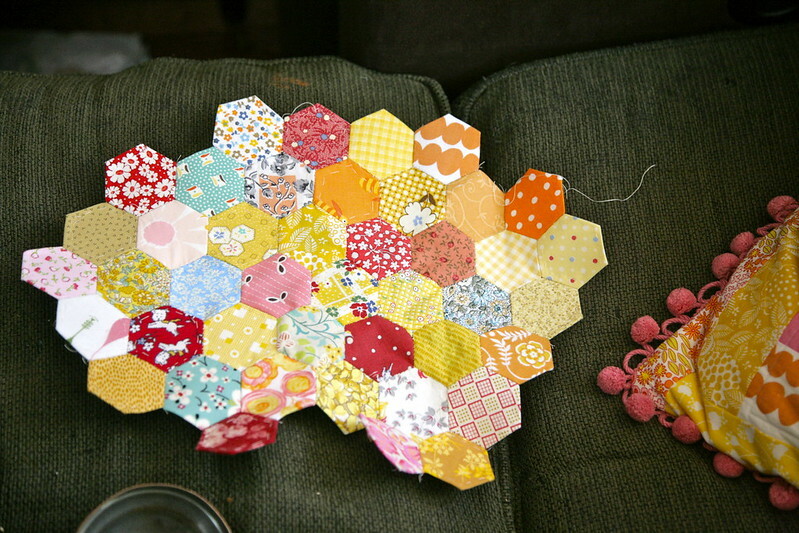 All those hexies are super impressive, too! 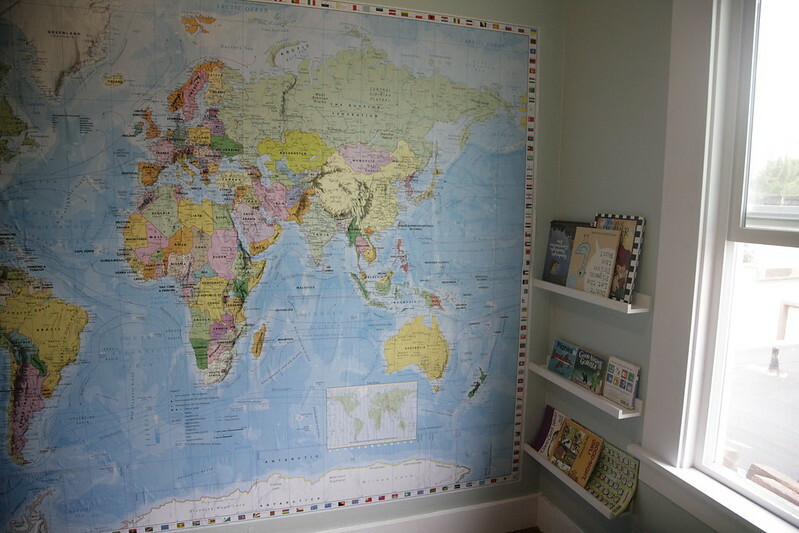 The wall map is great (from a distance - the inaccuracies would drive me nuts too), and how wonderful that Australia is right at kid's eye height! You've got so many fun projects going on- I love it! I've never made a pillow before, either. Something else to add to my to-sew list. Yours are lovely! The POMS!!! I love them so!! Why did you not shove these in my face to brag when I came by?? ?